Derby's claim to fame is having the highest tides of any Australian port. 11 m (or 36 feet) of tidal difference means there is an enormous amount of water rushing in and out every 6 hours. Add to that the silty outflow of the Fitzroy River: It means muddy waters! Mudflats, mangrove swamps... No, Derby is not your typical tropical holiday destination. So what are all the tourists doing here? For most of them Derby is the beginning/end of their Gibb River Road adventure. Even travellers who don't intend to drive the whole length of the Gibb River Road often stop over in Derby. 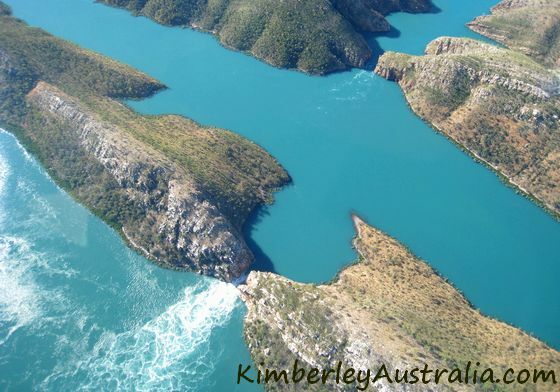 They then travel along the first, well maintained section of the Gibb River Road before turning right, cutting across to the highway and visiting the Windjana Gorge and Tunnel Creek national parks on the way. Another draw card is the Buccaneer Archipelago, a group of 800 to 1000 of some of the most remote islands in the world. This is also where the Horizontal Waterfalls are located, a phenomenon created by the huge tides rushing through narrow gaps between islands. Derby draw card: the Horizontal Waterfalls. © Photo by reader Maurice. So what's there to see in Derby? 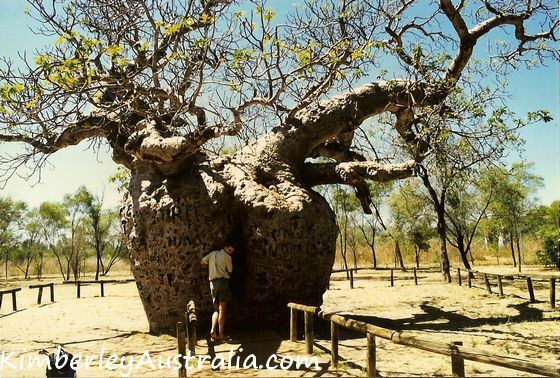 Derby calls itself the "Home of the Boab Tree". Boabs are used as street trees and give the town a special character. Considering its remote location the town is surprisingly big. It's also very spread out, which makes it seem even bigger than the population of about 4500 would suggest. The town center is, well, it's hard to identify. I'm not sure there is one. When you reach Derby and just keep driving you eventually reach the other end of town where the tourism information, the post office, police station etc are located. That part is considered the centre I believe. Following that main street eventually takes you to the Derby Wharf, the famous jetty where you can watch the 11 metre tides rushing in and out of the King Sound. It's also the place to be for the sunset. Every evening a stream of four wheel drives arrives here to claim a spot along the rail. 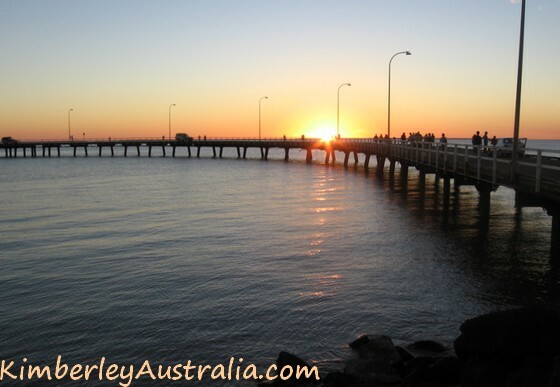 Tourists unfold their camping chairs, set up their eskies and bait their handlines, joining the locals in what's probably been a ritual since the jetty was built in 1885. I've never seen anybody catch a fish here, but that doesn't matter. It's the place to be for sunset. Since nobody ever catches people hardly ever catch anything the Wharf Restaurant and Take Away is doing good business. Get your order in early or you'll be waiting for a long time. The food is delicious, by the way. If you are interested in Derby's history there are a lot of places for you to stop at: the Centenary Pavilion, the Wharfingers House Museum, the Old Derby Gaol, the Pioneer Cemetery... The Derby Visitor Centre has information on two Heritage Walks you can do to take in all those historical attractions. Derby is the Kimberley base for the Royal Flying Doctor Service but sadly their base is not open to visitors any more. Other places to ask the visitor centre about are the art gallery, the wetlands and the observation tower there (excellent bird watching), the botanical gardens and the Joonjoo Botanical Trail. Seven kilometres out of town is the site of the Boab Prison Tree, a 1500 year old boab tree that was used as an overnight lockup for prisoners. This old photo shows how I first saw the prison boab. Today the tree is a registered Aboriginal site and more thoroughly fenced off. Also in the area are Myall's Bore and Cattle Trough, a 120 metre long cattle trough that could handle 500 bullocks at a time, and Frosty's Pool, a small pool used for bathing by troops stationed in the area during WWII. And last but not least there is the Pigeon Heritage Trail. The self drive trail follows the story of Jandamarra, a local Aboriginal freedom fighter or "outlaw" (depending on who you ask), who became known to the public and the police as Pigeon. The drive begins in Derby, taking in the Old Goal and the Pioneer Cemetery. It follows the places connected with Pigeon's operations and eventually takes you to the national parks Windjana Gorge and Tunnel Creek, where Pigeon was shot in 1897. You can pick up all the necessary information and brochures from the Derby Visitor Centre.